Some of you may have noticed that the Photo Of The Week has been on hiatus and I felt it was time that I explained the absence. Recently I visited one of my favorite antique stores and was stopped by two of the clerks who worked there. "We have something that's been waiting just for you," they said. "We think you're the person who can do it justice and honor these people." A tall order I thought, but they had piqued my curiosity. From a locked cabinet they removed a small leather bound album. Two local designers who frequent the Paris flea markets had gotten the album with a larger purchase and didn't really know what to do with it. What I found inside absolutely captivated me. The album belonged to a young woman named Jennie M. Corbett who lived at 24 High Street, Newhaven, Sussex, and was dated January 10th, 1915. 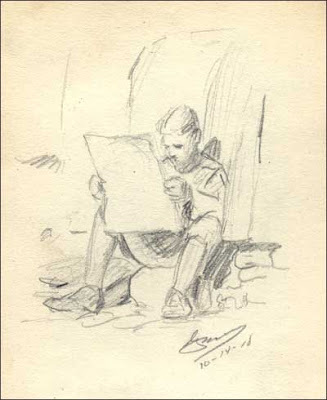 It is filled with pencil, pen and ink sketches, watercolors, and oils; many done by young men serving in the military. I have been researching each of the names I've found. One young man is listed as having been wounded at Hollenzollern Redoubt, 18 March 1916. I found he survived his wounds only to die of influenza the next year. Here is one of the sketches. Each more wonderful than the next. I selected this one in celebration of Terry Thornton's series of articles on food and in particular today's addition. It is quite fitting. The Tadpoles form a singing class. Safe in their native bog. But it is trouble thrown away. Such teaching is a joke. For when grown-up with arms & legs. Then a friend asked me to look into two leather bound sketch books in her possession that were done by a soldier serving in France named Gerald F. Perry 1918-1919. It is as exciting as my album. He sketched everything he saw. Women washing clothes, soldiers, farmers, men drinking in outdoor cafes. It is absolutely amazing. 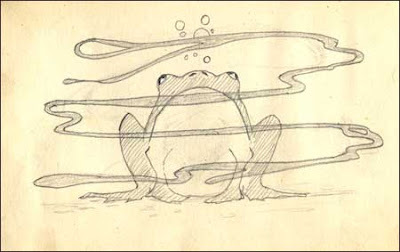 And another frog sketch! This has become a huge project and I am dialing back on the research. My research eyes have been bigger than my research hours. But then you know how that happens. I will be bringing the Photo Of The Week back next Monday. Maven, What a wonderful project you are on --- I hope you make connections all over the world with this one. Bravo! And the frogs were the icing on the cake, so to speak, weren't they? 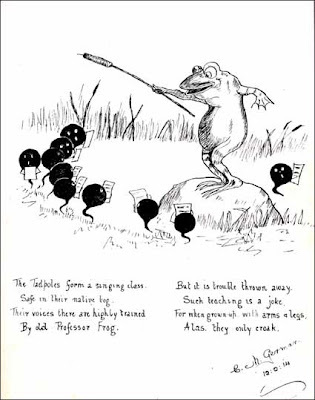 The frogs teaching the tadpoles to sing must be my favorite 'cause you just know as those little singers morph into mugwumps their voices are gonna change! What fun. Thanks for thinking of me when you see frogs. LOL! These albums are quite amazing - and indeed you are exactly the person meant to own them and research them. What incredible talent in the 'ordinary' people of the past - I am so looking forward to learning more about them from you! Maven, you never cease to amaze me. Your curiosity is an admirable trait.